The Eagle View Suite at the Iso Syöte Hotel offers its guests an innovative and immersive experience. 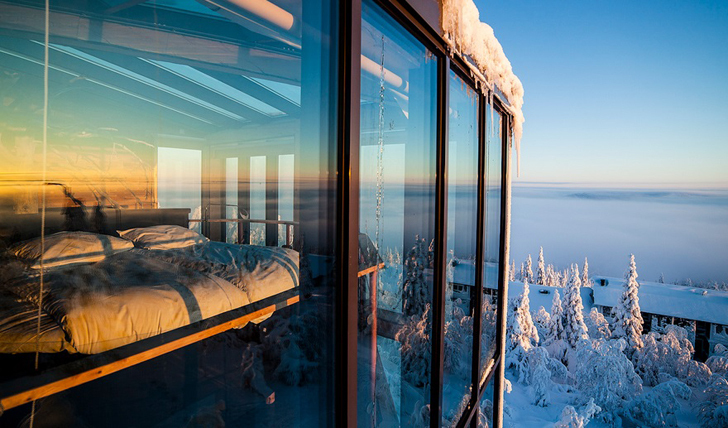 Suspended high above the endless landscapes, you really will have an eagle’s eye view over some of Finland’s most spectacular scenery. Iso Syöte Hotel is situated in Finnish Lapland, no more than two hours’ drive from the areas three main airports; Rovaniemi, Oulu and Kuusamo. The suite itself sits atop the south corner of the hotel’s building and boasts unbeatable views over the surrounding hills and forestry. Easily accessible yet at one with nature, this is the place for you if you’re looking to completely immerse yourself in the natural beauty of Lapland. The Eagle View Suite makes the most of its elevated position with walls and a ceiling made entirely of glass. Whichever way you look, you’ll be treated to views of breath-taking landscapes and if you’re really lucky you may even be treated to a Northern Lights show from the comfort of your own bed. Divided by two floors, the suite has a separate living room with an open fire perfect for a cozy winters’ night. There’s even a private sauna connected to a luxurious bathroom and a private Jacuzzi. The theme of a birds nest is implemented by the presence of a tree that grows through the middle of the suite, up to the second floor. 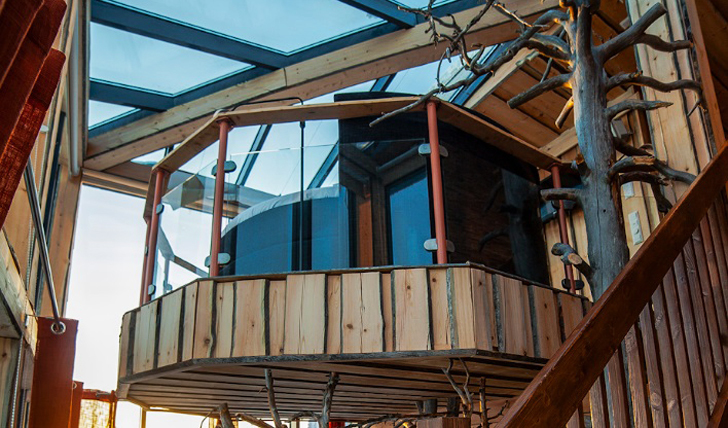 It’s the tree branches that form the ‘nest’ where the bed can be found beneath the glass ceiling. It really is as incredible as it sounds and you’ll be feeling at one with nature in no time. We love that this suite manages to offer a direct connection to nature without scrimping on the luxury elements. Nothing can beat a 360 degree view over Finnish Lapland and the chance to see the Northern Lights directly from your bedroom. Despite the glass walls, you really feel secluded, suspended above all the other visitors to this beautiful part of the world. It’s the sort of experience that will stay with you for a long time. And that’s the best sort of experience, wouldn’t you agree?